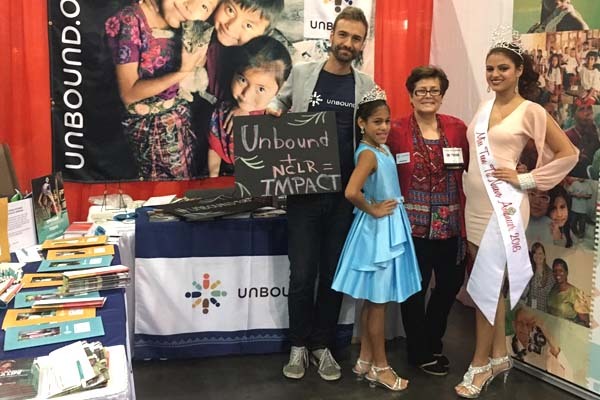 Gustavo Aybar, Barclay Martin, Dora Tiznado and Paola Moreno, all staff members at Unbound’s Kansas City office, traveled to Orlando to connect Unbound with the Latino community at the NCLR annual conference. Read what the team had to say about NCLR before heading to Orlando. 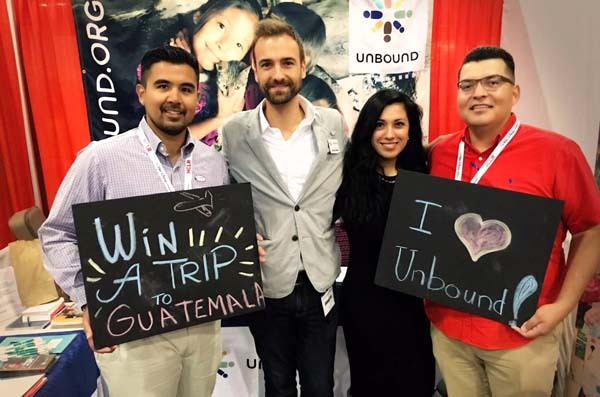 Unbound hosted a giveaway for a free awareness trip to Guatemala. Participants, both at the conference and around the country, could enter by posting and sharing a series of photos or posts on social media. At #Unbound908 booth at NCLR, chalkboards were provided to use for social media posts, where passersby could share what they believe all humans deserve. When Celine Herrera, Miss Teen Tu Nuevo Amanecer 2016 (right) and Joselyn González (center left), who competed for Miss Little Tu Nuevo Amanecer, passed by booth #Unbound908, Unbound staff members Dora and Barclay stopped them to congratulate them on their pageant participation. They stayed and learned about Unbound and shared about Tu Nuevo Amanecer, a Central Florida news magazine, which hosted the pageant. Barclay and Paola welcomed fellow Kansas Citians to the Unbound booth, Ernesto Marquez (left), Community Business Development Specialist for the Hispanic Economic Development Corporation (HEDC) in Kansas City, MO, and Michael Carmona (right), Director of Community & Business Development for HEDC. 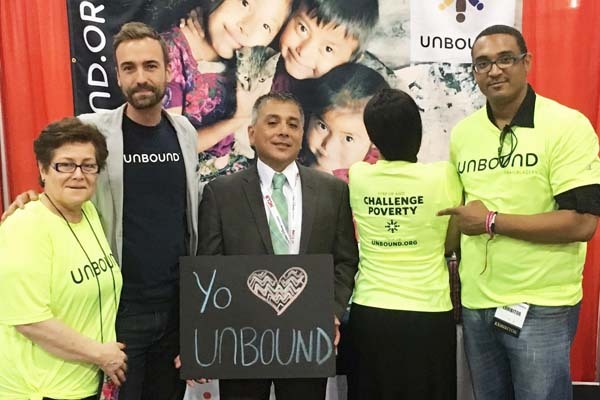 As Unbound finds new ways to connect with the Latino community in the United States, connecting with others near our headquarters in Kansas City is a great place to start! 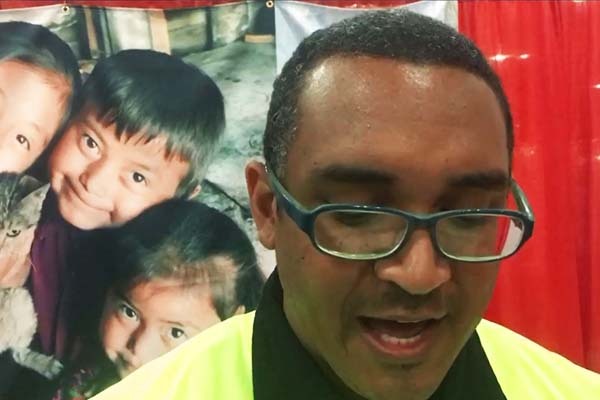 The Kansas City connections continued as Pedro Zamora, Executive Director of the Hispanic Economic Development Corporation, stopped by the booth to chat with the Unbound team (from left, Dora, Barclay, Pedro, Paola (showing off her Unbound Trailblazers shirt!) and Gustavo). Pedro and the HEDC are committed to creating economic opportunities in Latino communities, both in the United States and abroad. 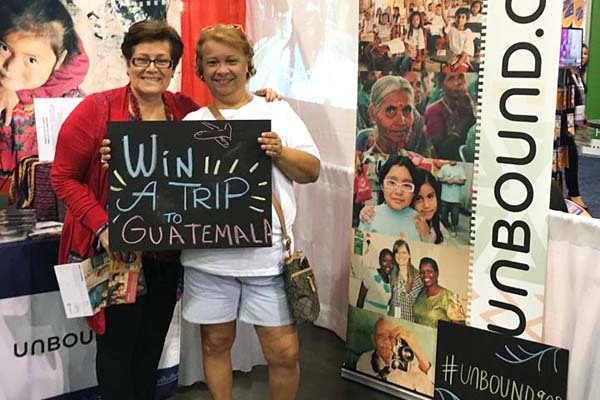 Participants all over the country and at the conference were invited to enter a giveaway for an awareness trip to Guatemala by sharing Unbound/NCLR posts and photos on social media — multiple shares meant multiple entries! After entering the contest 11 times, our winner was an Unbound sponsor who had learned about the contest through her participation in a focus group for sponsors in the Orlando area. Maryluize DaSilva has been a sponsor since 2012 and is deeply passionate about Unbound’s work. Her presence on the upcoming trip will truly be a blessing to all those in attendance, including her sponsored friend, Luis, who she’ll be able to visit with for the second time. Congratulations, Maryluize, and thanks for your continued support! Thank you to all our sponsors, staff and supporters who made our visit to NCLR a success. 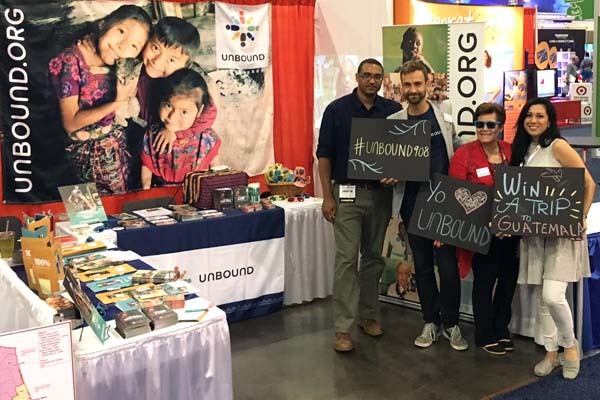 Unbound was honored to have a presence at the annual conference and is excited to continue connecting Latinos in the U.S. with our work in 13 Spanish-speaking countries in Central and South America. Join our community of sponsors throughout the world. Sponsor today.